This is Affordable Solar’s blog series on best practices, tips, and tricks to being a successful solar designer or installer. My inspiration for these entries is pulled from my years of experience working in solar photovoltaics, from shipping to sales to design and drafting, and from my work with installers around the country. I am not the ultimate authority, but we have had a track record of success and I want to share that with you. Correctly sizing grid tied solar arrays is critical in today’s solar market. Most utility rebate programs only pay back for the total amount of energy used at the site, and money that could have been earned from over-producing is lost. Because of this, the penalty for over-sizing a solar array is a less cost-effective system and a longer payback. In an industry where every penny per watt is important, it is very important that the solar array be sized accurately to the site-specific electric usage, array orientation, and the type of equipment used. Where η is the DC to AC system efficiency, Watt hours are obtained from your utility bill, and sun hours are found using an online calculator from the National Renewable Energy Laboratory (NREL). All of these factors are described and expanded on, so there is a clear understanding of everything that affects the size of the solar array, and more accurate system sizes can be calculated. Once values for all three are obtained, it’s a simple matter of plugging and playing to get the solar array size in watts. Often you will have more than one year of data to work with. It is important that a time period that best represents the future electrical usage of the site be selected. In most cases this is the most recent year’s usage at the site. However, in many cases there are “outlier” months where a weather disaster or special event causes a spike in usage that the solar array doesn’t need to take into account. In these cases, it is important to substitute data from the same month in previous years or take an average of other months’ usage data instead. Creating an accurate estimation of the site’s future electrical energy use is the first step in determining what size solar array will offset that usage. Sun hours can be a confusing term. It calls to mind the number of hours sunlight is hitting the solar array, which would correspond to average hours of daylight. The reality is more complicated. Sun hours are derived from the total amount of sunlight a given site receives, factored in with its intensity, the amount of particulate matter in the air, temperature, and other environmental factors that affect the amount of the light that reaches the solar array on the ground. Solar panels are tested and rated to a specific solar intensity and environment. The sun hours at any proposed site are equivalent to the number of hours a solar panel would produce rated power under these test conditions. Additionally, the number of sun hours a site receives is dependent on the orientation of the solar array or how it tracks the sun. Because of the factors that affect sun hours, it is best to use values for sun-hours obtained through analysis by NREL (National Renewable Energy Lab). For the entire United States, and many international sites, NREL has done testing to determine the average number of sun-hours a given location will receive. To find data for your location, the most popular method is to use NREL’S PVWATTS solar design tool (http://pvwattsbeta.nrel.gov/). By entering your zip code, address, or coordinates, the viewer will locate your site on the map and give you the option to “Go to System Info”. There are a few editable fields. To determine the number of sun-hours, only the Array Type, Array Tilt, and Array Azimuth should be modified. The Array Type is the type of mounting structure you are using, whether a fixed system or one that tracks the sun on one or two axes. The Array Tilt is the tilt angle from horizontal that the solar panels will be at. The Array Azimuth is the solar array’s orientation with respect to True South at 180 degrees (An array pointing north would be at 0 degrees, east corresponds to 90 and west is 270 degrees). 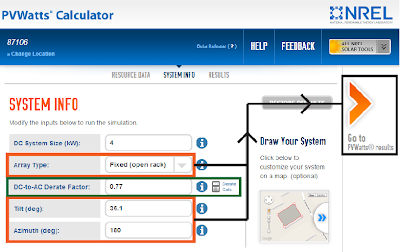 After entering the proposed orientation of the solar array in the orange boxes, hit “Calculate” and you can see the sun hours for your site specific conditions. This is found in the Results table, under the column “Solar Radiation”. There is an average value for each month, which corresponds to a daily average for the month, as well as a daily average for the year. The green box highlights the DC to AC system efficiency and its individual factors, and will be explored in the next section. The DC to AC system efficiency is a value that is estimated from the various efficiencies in the system from the solar panels to the point of interconnection with the electric grid. The standard in past years was to assume a value between 75 – 80%. Nowadays, with better equipment and installation standards, values higher than this can be safely used to get more accurate sizing of the solar array with less over-production. 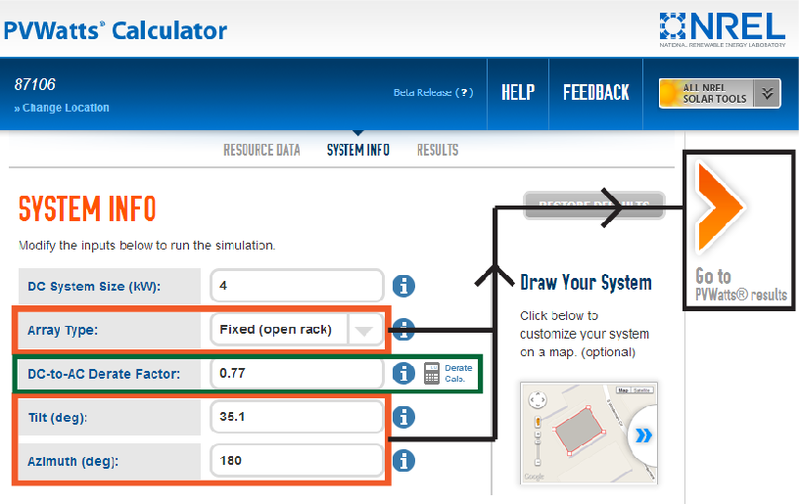 For understanding solar system efficiency and the specific efficiencies that make it up, NREL’s PV Watts solar calculator is an excellent resource. Within the same tool used to obtain a site’s sun-hours, there is a field that can be modified called “DC to AC Derate Factor”. This can be adjusted as is, but the real magic happens when you go into “Derate Factor Help” and bring up a detailed list of everything that affects it. See the green box in Figure 2. All of the factors may look intimidating, but for the most part only 2-4 will ever need to be modified. The other values can be changed if you know your site will receive some shading or significant snow-cover in winter. Otherwise it’s best to leave them alone. For PV module nameplate DC rating, the default value is 0.95. This value is based on two things; the initial “burn-in” that can reduce module output once they’re installed, and the power tolerance manufacturers include with their solar panels (typically +/- 3 to 5 watts). If you consider major brands, many solar panels on the market today have a positive-only power tolerance (+ 3 to 5 watts only), which means they will always produce rated power out of the box. Because of this, if you are using a solar panel that has a positive-only power tolerance, this value can be changed to 0.98. Inverter and Transformer represent the overall efficiency of the solar inverter that will be used. The most accurate values for inverter efficiency have been obtained through testing by California’s Energy Commission (http://gosolarcalifornia.ca.gov/equipment/inverters.php). These values are slightly lower than the maximum efficiencies for inverters found on data sheets. However, they are typically much higher than the placeholder value, 0.92. For example, a Power One 4.2 inverter is weighted at 96% efficiency at 240V, a 4-point gain in efficiency over the default value. Mismatch arises from manufacturing tolerances within each solar panel. Each one will produce a slightly different voltage and current under ideal conditions. It’s not enough to grossly affect the output of a string of solar panels, but it is enough to introduce a loss in the system. Standard string inverters are the only inverters affected by this value, because they depend on groups of solar panels wired together into strings to produce power. Micro inverters and DC-DC optimizer systems are not affected by individual solar panel variance, because each inverter or optimizer is only concerned with maximizing the power output of their solar panel. Because of this, the losses due to mismatch are completely marginalized; the factor can be modified to its maximum value of 0.995. One added benefit of using a microinverter under each solar panel is the virtual elimination of any DC wiring losses. Because of this, if you are using a microinverter as opposed to a DC-DC optimizer, the DC wiring losses can be minimized as well. Enter the modified values into the calculator and hit “Calculate Derate Factor”, and the difference is clear. For example, using a Hyundai or CSI solar panel and a Power One 4.2 inverter, the system efficiency is .828, or 83%. It’s a pretty big gain from a 77% efficient solar array, and can make a huge difference when you size the solar array. Even using a module with a negative power tolerance, like Astroenergy or Trina, you can see system efficiencies of 80% or higher.